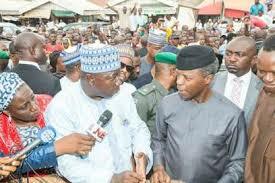 Video: Osinbajo in surprise visit to Garki market, Abuja – Royal Times of Nigeria. ACTING President, Yemi Osinbajo, is on a surprise visit to Garki market in Abuja. He is there to interact with traders and ordinary Nigerians to have a first hand knowledge of their feelings. The visit was part of his activities to mark the second year anniversary of the present administration. He interacted with the traders and promised to look into some of the complaints raised. This is the first time such a visit to a market would be taking place. I just stopped by at theGarki market, Abuja.